The best strawberries you’ll ever taste will come from a garden. They have a rich, aromatic flavour that you just don’t get from supermarket strawberries. Strawberries are incredibly easy to grow and will thrive almost anywhere – in borders, containers or hanging baskets. 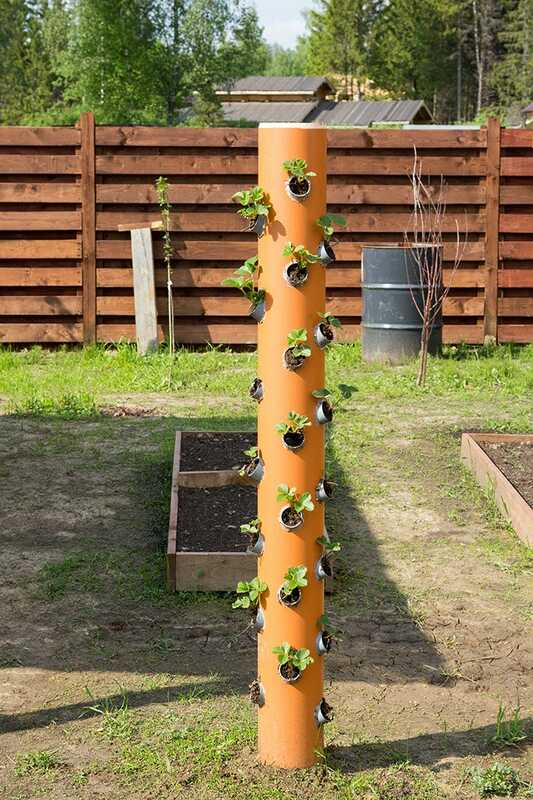 A strawberry tower is an innovative way to grow lots of strawberry plants on a small plot of ground. It saves space by growing upwards which keeps the plants off the ground and out of reach from insects. Decide on the length of the unit and cut the tower tube and watering tube accordingly. Don’t forget to make the watering tube 8-10cm longer. Drill vent holes in the watering tube. Only drill these in the top 2/3 of the tube as the water will run down to the bottom plants. If you put holes all the way down, the upper planter won’t get quite enough water as it will all rush out of the lower holes. Cut the geotextile or hessian to the shape that will cover the holes in the watering pipe. You don’t want roots getting in there and clogging it up. Carefully, with a knife, whittle down the cork until it fits the end of the watering tube. Now seal it off with duct tape. Cut the holes in the tower tube. Remember - only put holes on the surfaces that will get sunlight. Make 3 rows of holes and stagger them with holes about 20cm depth apart vertically. Leave the last 20cm intact with no holes. Place the large container against a wall – a corner is best so the tube is less likely to fall over. Place end cap over the base of the tube. Insert the watering tube then fill the bottom 10 cm with coarse gravel. For the lowest hole, plant a companion plant as there is less incentive for pests to climb up. When filling, it’s easiest to pour the soil from the top and poke the plants in the holes. Make every 6th one a companion plant. Make sure you water your plants daily in warmer weather and hopefully you’ll be enjoying delicious, home-grown strawberries all summer long. Happy gardening! We would love to see a photo of your DIY strawberry plant tower. Email us a picture to creative@cosyfeet.com and we’ll feature it on our social media pages.